Following the death of Mr. Cantor in 2002, the SS United States was once again put up for sale. Things looked bleak as it was almost certain that she would be going to the scrapyard this time. However, a white knight appeared on the horizon in the form of Norwegian Cruise Line. As mentioned earlier, Norwegian had considered buying the United States once before but instead opted to buy the former SS France. The conversion of that liner into the cruise ship SS Norway had been a triumph for Norwegian and indeed had proven the feasibility of large ship cruising in the modern market. However, Norwegian's current interest in the United States was not primarily driven by a desire to replicate its success with the Norway. Instead, it had its roots in an ill-starred U.S. government program called “Project America.” In 1993, the Clinton Administration commenced an initiative to stimulate shipbuilding in the United States and to reduce U.S. shipyard's dependence on military projects. A few years later, Congress authorized a pilot program under which a small U.S. cruise ship operator, American Cruise Vacations, would be given loan guarantees and certain exclusive cruising rights in exchange for ordering some cruise ships from a shipyard in Mississippi that was primarily involved in building military ships. Eventually, ACV ordered two ships and had an option for a third. The shipyard soon found that building cruise ships is different than building warships. It had to make capital investments in new equipment and fell behind on the delivery schedule. Meanwhile, the cruise industry was experiencing a downturn, which saw many small operators go under. Following the terrorist attacks of September 11, 2001, the market for vacation travel deteriorated further and ACV went bankrupt. This left an important military shipyard holding a partially completed cruise ship, parts for a second cruise ship and plans for a third. With Congress' urging, the yard had made a substantial investment and it now looked as if it had no buyer for these cruise ships. The politicians turned to the Navy and strongly suggested the Navy should buy these ships. A Navy team dutifully went down to Mississippi and took a look but in April 2002, the Chief of Naval Operations reported unsurprisingly that the Navy did not really have a need for cruise ships. At this point, Norwegian intervened. It offered to buy the cruise ships if Congress would give Norwegian certain exemptions from the Passenger Vessel Act of 1886. That law (often confused with the Jones Act which applies only to the transport of goods) requires that passenger ships sailing on itineraries composed entirely of U.S. ports be U.S. flagged, built in the U.S., and sailed by U.S. crews. In most cases, the Passenger Vessel Act does not create a significant problem for the major cruise lines even though their ships are foreign flagged. If a line wants to offer a cruise involving several U.S. ports, it need only add a call at a nearby Canadian or Mexican port to the itinerary. But it does create a problem in Hawaii. There are no nearby foreign ports. Thus, a foreign flag cruise ship has to go well out of its way in order to do a Hawaiian cruise. This makes such a cruise more expensive and the itinerary less attractive to prospective passengers. Under Norwegian's proposal, the three ships would be finished or built in Europe but would fly the U.S. flag. This would allow Norwegian to offer cruises that just sailed the Hawaiian islands. Inasmuch as this plan promised to create jobs in Hawaii and would save the shipyard, Congress agreed to the plan. As a result, the partially-completed cruise ship was towed to Germany where it was completed as Pride of America. 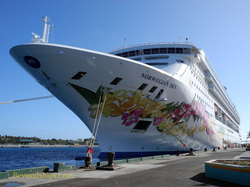 One of Norwegian's existing ships, Norwegian Sky, was transformed into Pride of Aloha and the Meyer Werft shipyard in Germany built Pride of Hawaii. Norwegian foresaw a great future for its NCL America division. However, to expand beyond the initial three ships would be difficult. The recent track record for building cruise ships in America was not good. Therefore, it decided to purchase several old U.S.-built passenger ships that could be converted into cruise ships as the demand of NCL America's offerings took off. These included the SS Independence, the SS Constitution and the SS United States. A number of possibilities were envisioned for the ship's return to service. Colin Veitch, then CEO of Norwegian, told reporters that taking advantage of her speed, the United States could do fast cruises from New York through the Panama Canal to Los Angles or San Francisco. In addition, it could cruise from San Francisco or Los Angles to Hawaii with only a few sea days. In 2006, the year that the final Project America ship, Pride of Hawaii, entered service, Tan Sri Lim Kok Thay, the head of Star Cruises, which owned Norwegian at the time, reportedly proclaimed that restoration of the SS United States would be the next project for NCL America. Accordingly, in 2007, Norwegian undertook an extensive technical review of the ship. Despite years of neglect, the ship was still structurally sound and capable of returning to service. To this end, Norwegian complied some 100 boxes of blue prints of the ship. But two insurmountable obstacles stood in the way. The first was the engine plant. When the SS United States had been in service, her engines had consumed a lot of fuel. Fuel was much less expensive in those days and the ship had operated with a subsidy from the U.S. Government but even towards the end of her days in service fuel consumption had emerged as a problem. Assuming that the existing engines could be made operable, the cost of running them would be prohibitive. A possible solution would be to close down some of her engines as had been done when Norwegian converted the France into the Norway. However, all the engines were needed to make the ship fast and Norwegian wanted the United States to remain the fastest ship both as a matter of pride and because the itineraries envisioned for her would require speed. The existing steam engines could be replaced with diesel engines as had been done on Queen Elizabeth 2 in 1986. But the replacement engines would have to be very powerful to keep the ship fast. They would be expensive to buy, install and operate. The second obstacle had to do with the cabins. Following the hazardous materials removal in 1994, all that was left of the ship's cabins were outlines on the decks. Therefore, new cabins would have to be created. However, these days cruise ship cabins are prefabricated modules that are slipped into place as the ship is being built. Norwegian could not find anyone who would build cabins within the existing framework of the United States for a reasonable price. Pride of Aloha and Pride of Hawaii were withdrawn from the Hawaiian market and became part of the main Norwegian fleet. Although Mr. Sheehan reports that Norwegian has since been able to turn around Pride Of America so that it “is one of the highest performing ships that we have,” it was clear as the decade drew towards a close that no more ships would be added to NCL America. Norwegian is a business and with no plans left for the United States, spending approximately $60,000 a month just to maintain the ship in Philadelphia was no longer justified. Accordingly, in 2009, Norwegian announced that the SS United States was once again for sale.